Battello is a prime location for a classic Northern New Jersey wedding with a dash of a New York City feel. A Battello Wedding Photographer captures incredible moments and views at this waterfront venue. Set on the Hudson River, Battello offers incredible views of the Manhattan skyline, along with offering incredible cuisine. The restaurant serves contemporary Italian dishes designed by one of New Jersey’s top culinary masters, Chef Ryan DePersio. The design of the venue was inspired by the nearby Jersey City marina and much of the decor has been salvaged and repurposed to add to the ambiance of the space. These reclaimed pieces include the rowboat that hangs above the entrance and the brass yacht lanterns that line the walls of the building. The highlight of the space is the floor to ceiling windows in the venue’s dining area. These windows provide a tranquil view of the boats that float nearby on the Hudson, with the captivating backdrop of the Big Apple. These windows are opened in the warmer seasons, allowing cool breezes from the water to blow through the space. This photograph shows the venue during a wedding ceremony. As a Battello Wedding Photographer I have taken pictures at this venue of both ceremonies and receptions, as Battello is able to accommodate both. In the image the bridesmaids walk in a happy line, one-by-one stepping into the sunlight to begin the celebrations. 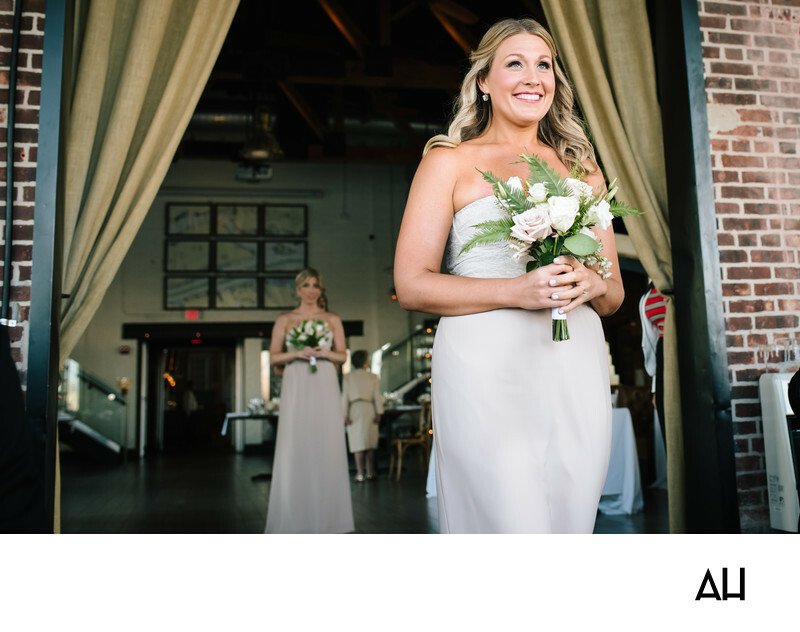 The girls wore neutral, blush colored gowns and held white roses as they proceeded to walk through the curtained doorway and onto the dock. The actual ceremony took place on the dock, making for picturesque photos throughout the event.